Currently, the back of my Ford F150 sports a parking decal and a white Apple sticker on the rear window and an "I Love Tabasco" sticker on the bumper. That would be more than enough, but now I've seen one more that I really want to add. In fact, I'd trade in all the others for this one (even if it meant tickets due to the loss of the parking sticker). A designer from Chicago who used a Windows PC, Paul McAleer, decorated his car with an Apple sticker before he even bought a Mac. "The big thing for me, though, was putting an Apple sticker on my car even though I still owned a PC," he wrote in his Weblog. "I'm a geek; I thought that was the coolest thing. It still kinda is." That sticker in the picture above looks like an OS X dock from version 10.1 or 10.2. Regardless, it's still pretty cool looking, and I've never seen anything like it elsewhere. I traced the original article to the Wired website, and it was written in 2002. I even found Paul McAleer, who writes the blog Phonezilla (I could not find the blog post referenced in the Wired article). I've sent him a message on Twitter asking if he knows a good source for getting a sticker like his because this is evidently a custom job, but I haven't heard back from him yet. And I've been unable to find anything like his dock sticker out there. No one is reproducing them for sale from what I can (or cannot) find. I can't even find a company that does wide custom stickers like the kind that promote universities on the back of car windows. Sure I could print something up on my own, but I have a feeling that it would look homemade. I'd have to get it laminated to keep the ink from my printer from running as soon as it got wet. Plus, I'd want something really wide—even wider than McAleer's if possible. I'd like to see a dock sticker that would span the entire length of the back window of my Ford F150. So, in the meantime, I started playing around with screenshots of my dock. I actually keep my dock vertically on the left side of my screen, but I do believe that a horizontal dock would look best on a windshield. Plus, the OS X dock is more easily recognized for what it is in horzontal mode than in the vertical. McAleer's dock has 12 icons on it from the Finder on the left to the Trash on the right. Maybe that was all he had on his dock in 2002, or maybe that was the best that could be done with smaller screen sizes back in the day. What I've found is that when trying to achieve the magnification wave in the dock, if there are too many icons, the edges of the dock will move off the screen. After temporarily moving my dock to the bottom of my screen, I started removing one icon at a time—like throwing excess cargo from a ship—to achieve a dock that would remain on the screen when magnifying one section of it. However, I really believe that McAleer's middle-rightward wave captures the essence of the OS X dock with magnification turned on. If anyone has an idea of where to get something like this made, let me know. I'd want the final product to have enough quality to last for a while in all kinds of weather, and preferably span most of the length of my back window. I even believe that if there are any aspiring entrepreneurs out there, people would actually pay for rear window decals of the OS X dock—whether custom screen shots like mine or even the dock from a standard new setup in OS X. As always, your questions, thoughts, comments and rebuttals are welcome below. I did hear from Paul McAleer, but he told me that the dock sticker wasn't his. He merely put a regular Apple sticker on his car. That makes sense when rereading the text I quoted above, and upon closer look in Kahney's book, I now realize I should have paid more attention to the photo caption, which was to the left of the image, and somehow I missed it. "Bob" from Germany (he declined to give his last name) wanted an original sticker for his new car, so he created a copy of the dock in Mac OS X and stuck it in his rear window. "The simple white apple is nice, but everybody has that. So I thought, Why not go a little step further?" He said. "Originally I wanted to recreate a complete desktop, but I'm pretty lazy." His last car had a sticker showing the old finder icon and another that read "I won't brake for Windows users." His new dock sticker has drawn lots of praise from Apple fans since he posted pictures on the web, but no one knows what it is where he lives. "I live right in the middle of nowhere and nobody knows what the dock is," he said. So, my apologies for attributing the dock sticker to McAleer, but hopefully, since over six thousand (!) people saw this post over the holiday weekend, I drove some of that extra traffic to his blog. Well, I fear that in the transition from MobileMe to iCloud, some of us are about to receive a deprovement. According to the MobileMe preference settings on my MacBook Pro, I’ve been a member since January 5, 2000—the very first day it was offered. Of course, it wasn’t called MobileMe back then. Way back in 2000, it was called iTools, and it came free in OS 9. Then in 2002, the name was changed to .Mac (pronounced dot-Mac). And of course, 2008 saw the catastrophe of the transition to MobileMe. I realize that MobileMe (or any of its predecessors) has received plenty of criticism and has often been the joke of the tech world—plenty of which was justified, but not all. In fact for heavy users of MobileMe, of which I would include myself, MobileMe has been a very good all-in-one solution for a number of services. Outside of slower-than-I-would-prefer iDisk transfers, the 2008 fiasco has been the only real downside in my experience, and that was temporary. Rather than having a half-dozen services, all with separate logins and passwords, I had this one service that did everything I needed and had connections from a number of software applications developed by both Apple and third parties. I use MobileMe as my primary email service. 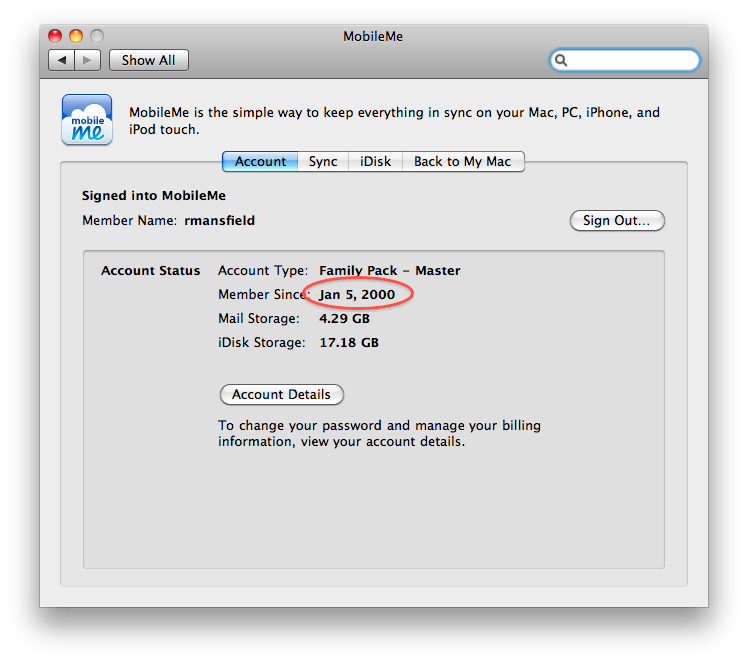 In fact, I have a number of MobileMe email addresses including RMansfield@mac.com (or me.com—either one works). Other aliases, such as thislamp, cast.iron, and GoSP, all forward to my primary account and cost me nothing above the $99 yearly fee I've paid since the service transitioned from iTools to .Mac. So, from the above message from Apple, I understand that my email (even the old .Mac addresses), address book, calendar, and bookmarks will still sync. But there are other features of MobileMe that aren’t mentioned here which have a number of users similar to myself scratching our heads to wonder what the future holds. Webhosting. Two of my websites reside on MobileMe. The first of these is my original This Lamp website, which still resides at a mac.com address. The other is a site for my local homeowners association. I’ve stated that I want to gradually move all of the posts on the original This Lamp website over to the new site where you’re reading this. Part of my concern for the move has been that the .Mac domain will eventually go away and the site would simply be gone unless I moved it elsewhere. But even if I moved it somewhere else, there are thousands of internal links that would be broken as well as incoming links from other websites. And although I do not use iWeb, there are tens of thousands of users who publish iWeb websites directly to MobileMe. There are plenty of reasons to pick at iWeb or hosting a site on MobileMe, but the fact remains that it has been a very convenient way for many Mac users to quickly publish a website. After June 30, 2012, what happens to all of these websites? What happens to my non-iWeb websites which reside on MobileMe? I had planned to gradually move my posts to the new site over the next three years. It looks like I may only have a year to do so now. iDisk. All those above-mentioned websites reside on what is called the iDisk, a virtual drive in the cloud that can be directly accessed from any computer or iOS device. Think Dropbox, but the iDisk has been around longer. Like Dropbox, I can even make certain files public or password protect them for specific users to download. I use my iDisk nearly every day. I use it the same way lots of folks use flash drives. I often create a Keynote presentation on my Mac and then transfer it to my iPad via iDisk. The other night, my wife Kathy, who is currently on the personnel team at church, had over 100 resumes to sort through because our church is looking for a new youth minister. We converted all of them from their original format (mostly MS Word) to Adobe PDF, dropped them in a folder on her iDisk, and then imported them into GoodReader on her iPad. This was an easy solution in spite of a slower file transfer than I’d prefer. Regardless, it worked and we knew it would work before we began. Besides iWeb, a lot of other programs use iDisk including Quicken Essentials which has a backup feature specifically for use with iDisk. I use this twice a month to create a separate backup from my regular full-system backup. I realize that I could simply copy the file elsewhere, but the convenience of the service lies in the fact that it’s built into the Mac version of Quicken. As you can see in the first graphic of this post, I have 17 GB of content in my iDisk. That includes websites, photos, videos, backups, transferred files, password-protected files for specific individuals to download, files linked to other websites (hosted both on MobileMe and off MobileMe—including individual files and videos linked from this site) and who knows what else. The issue is not simply moving it to another service. I do have a free Dropbox account, and I know I could pony up some cash and get more space. But in addition to the hassle of moving to another service, if iDisk goes away, I’m going to end up with hundreds of broken links and loss of the simple internal functionality that I have now. The new iCloud service doesn’t offer 20 GB of space; users only get 5 GB. If this were simply a name change as has been done in the past, and I got to keep my iDisk, none of this would matter. Perhaps Apple will allow users to purchase more space, but they haven’t made this clear. In fact, there’s not even a hint, as of this writing, that a user will be able to purchase more space. MobileMe Gallery. Also residing on the iDisk is all the content I have in my MobileMe gallery. That includes thousands of photos and quite a few videos. There are lots of both that I share primarily with family that I don’t care to share on this site or on my Facebook page. Yes, there’s Flicker and yes, there’s YouTube. But MobileMe Gallery has been a one-stop shop for both photos and video. Moreover, YouTube limits the length of my videos to about 15 or so minutes. I’ve posted videos to the MobileMe Gallery that are well over an hour in length. I can set options in iMovie that allow my videos to be downloaded from MobileMe Gallery in a variety of sizes and formats. There are direct publishing features in iPhoto, Aperture and iMovie (and scores of third party software) to MobileMe Gallery. Is Apple really going to remove functionality from these apps and kill this service? The new photo streaming function in iCloud only keeps the last 1,000 pictures a person has shot. It’s no substitute for MobileMe Gallery, which is where I often keep much older pictures for completely other purposes. I don’t know of any comparable service to the MobileMe Gallery on the market. If you do, please let me know. I may be looking. So now we wait. According to Apple’s communiqué above, more details about the transition will be made available when OS X Lion and iOS 5 are released. It would be helpful, though, if we knew the status of these other features now, so we could determine whether we need to begin making transitions to other services or if we're okay to sit still. The fact that I’m a “charter” member of iTools/.Mac/MobileMe means nothing to Apple, and I understand that. They are a company designed to make money, and Steve Jobs has never been one for nostalgia or sentiment. Fine. But when a person finds services such as these that simply work, with connections from lots of other programs, creating a unified system and experience, one is inclined to invest plenty of time and resources to those services and that system. One expects it to be around for the long haul, regardless of name changes. It would therefore seem that 11 years of investment count for something. I’m not asking Apple to give me anything for free, in spite of the new iCloud services, which will be free. Instead, I’d ask that I could continue with the same functionality I have now, and I’d be willing to pay for the privilege. I’m certain I’m not alone. Overnight, literally thousands of posts have been added to Apple’s MobileMe support forums. Hopefully, this will prod the PTB at Apple to give us more details about the MobileMe to iCloud transition now instead of later. As always, your thoughts, comments, questions and rebuttals are welcome in the comments section below. If I hit traffic at the wrong time, I can be in the car up to an hour each day traveling from home to my office and back. Sure, I like music, but just not that much. It seems a bit mindless after awhile. Talk radio? Even more mindless. So I listen to a lot of audiobooks, podcasts, lectures from iTunesU and other sources—you get the idea. I import them into iTunes and then I transfer them to my iPhone. You've heard the old saying, "Necessity is the mother of invention." Well, for me this afternoon, it was the mother of discovery. See, I'm teaching a six-week Wednesday night class at my Baptist church on understanding and dialoguing with Jehovah's Witnesses. Just as I do with my Sunday morning Bible study, I like to over-prepare. Certainly, I don't mind saying, "I don't know the answer to that; I'll get back to you," but I'd prefer not to if I don't have to. So this afternoon, as I was packing up to drive home, I thought to myself, I wish I had an audio book about Jehovah's Witnesses to listen to on my commute home. I wondered if there was something cheap at christianaudio.com. There wasn't. I also looked at a couple of other places. Then, from the far recesses of my mind, I had this vague memory of reading about Mac OS X Snow Leopard's ability to convert text to iTunes spoken audio. See, I knew I had content because I knew I had Zondervan's Dictionary of Cults, Sects, Religions and the Occult in Accordance. The question was how to convert it to audio. Noticing the fourth option in the right pane above (it was technically under the "Text" section), "Add to iTunes as a Spoken Track," all I had to do was check the box. Going back to Accordance with my text selected, I went to the Services menu and chose that option. A little gear showed up in my menu bar and began turning. Then iTunes came to the front and displayed a message that it was converting the text into audio. Then, it was through. Of course, I had no idea where it was. I finally found it under Music with the title "Text to Speech." I looked at the length. I had an a 1 hour and 17 minute audio track! I changed the name to "Jehovah's Witnesses." How long did it take to create it? I went back and created it again, this time using the timer on my iPhone to keep track of how long the process took. It took approximately two minutes! To gain some perspective, I copied the text of the article from Accordance to my clipboard and then pasted it into Word. That produced a 30 page, single-spaced document (with a space between each paragraph). So think about this—a thirty page document converts to an hour and 17 minute audio track, and it only took two minutes to create! Of course, I know what you're thinking. You're thinking, Yeah, but you have to listen to that mechanized computer voice. You're right, but so what? I've got my speech voice in Mac OS X set to "Alex," and while professional audiobook readers have nothing to worry about, the voice itself has very much improved over the years. Plus, I've spent countless hours of my life listening to people drone on in academic settings using lesser-sounding voices (that's meant as humor). Regardless, the possibilities here are endless. This opens up whole new doors. In Accordance alone, I have more material than I could probably ever read in my life anyway: books, theological journals, reference works, Bibles and more. 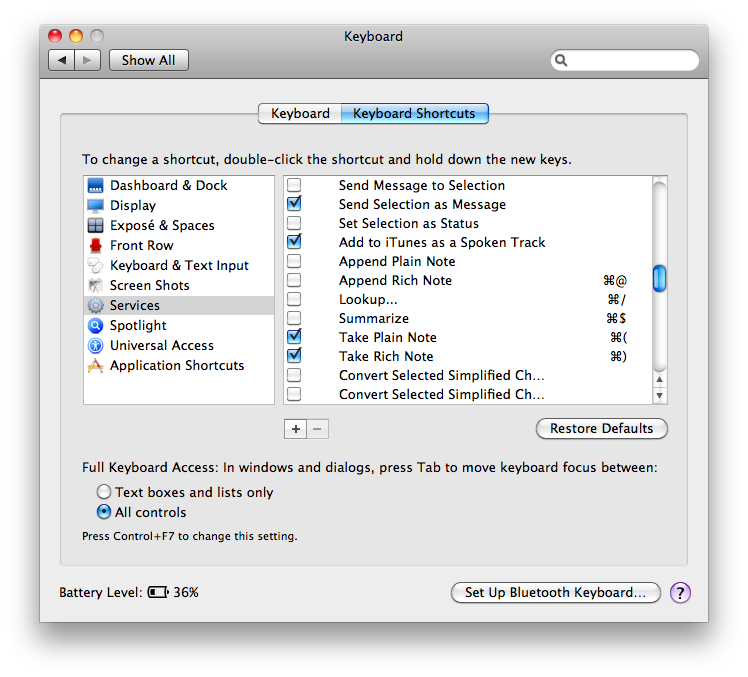 Further, the ability to convert any text to an iTunes audio track works with any text on my computer, regardless of the source. So, if it's an article from the internet, PDF, word processing document—they can all be converted to audio tracks which can be transferred to my iPhone. What great technology! I also assume that with time, the speech synthesis quality will improve, too. In the meantime, Alex will have to do.